In this case we were started with a business that was just 6 months old. They had a small client base and were now able to invest money in marketing. We spoke with the owner and decided that the 4 figures they were spending each month on pay-per-click ads would be better allocated towards search engine optimization (SEO) so we scaled them out of the PPC campaign and began an aggressive SEO campaign. SEO doesn’t always take a long time, even when we’re dealing with competitive keywords. 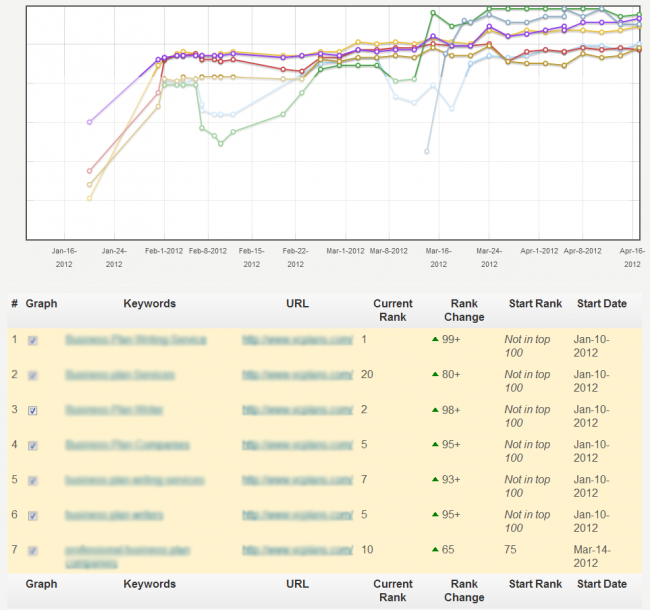 We went after nearly a dozen highly competitive keywords on a moderately aggressive SEO budget for this client. We’re not talking about low competition local keywords, we’re talking about a small business plan writing firm going after keywords with 700,000,000+ competitors for the keywords. We are still handling this client’s SEO campaign and expanding into new markets and new keywords to drive them even more traffic and leads. Our client is extremely happy with the results they’ve seen thus far and has even referred us to several of their clients for web development and SEO work. If you’re interested in learning more about how online marketing and SEO can help your business, contact us today at 888-918-1665 or submit the form to the right to request a free consultation!